So, the talk of the V-town is majorly comprising of the changes the two social-networking giants saw, in the past two weeks. Facebook updated to its timeline profile for all its users while Twitter went for a total changeover in terms of its interface and appearance. User friendly? That is for the users to decide but we all know, cribbers and supporters will always be there, to fight. We have a fair share of people complaining about the changes. To some extent, it might sound legit as some of them are complaining that in this fast-paced world, they really don't have time to try out and understand what changed in their social-sphere. Some even complained that by the time they will get to know about it completely, new changes will occur. Some people are very happy with the changes. In Facebook, they are saying their old posts are visible to them in a better way. The cover photo is giving a whole new dimension to the profile appearance. In Twitter, the concept of @Connect and the idea that the web interface is letting people know whether a user follows them or not, is good. Also, you can embed tweets now, to your own web-site. It is not surprising when some people are saying that they see a revolution.But only time will tell how successful this change is, for Facebook and Twitter both. Meanwhile, post the Kolaveri fever, we saw some more attempts of videos doing rounds: Chikni Chameli by Katrina Kaif, Various versions of the Kolaveri video, Flash Mobs in Chennai, Delhi etc. and likewise(I might even be missing out some). I won't discuss on these much, apart from the fact that, the lesser popularity of these videos as compared to Kolaveri only proves that there is a limit to everything-even viral videos. The past two weeks also saw some other new things in the social-sphere: a spam promising to be an obscene video of a wardrobe malfunction taking rounds in the profiles, where when you click the 'play' button, the thumbnail gets posted through your profile, on each of your friends' wall. I wonder if Anna camp ever thought of spreading their message in a similar way. And while the guys were busy clicking the play button which was closest to the 'other' button in the spammy video, girls were busy spreading Breast Cancer Awareness. Observe, the focus is on that same pair! But instead of spreading cancer awareness, the girls ended up going places outside the country, and although they had planned to confuse the guys with their statuses like: I am going to France for 13 months, I am going to Austria for 7 months etc., they ended up confusing girls more. The girls would comment on the statuses like "Why?" "What's going on?" while the guys laughed at them all the while. This reminded me of that "Jack Daniels-Chivas Regal" scam guys had last year. Even that failed like this. So I hope this blog post acts as an awareness and alerts people not spam, confuse, and of course, make things viral than they deserve to be. But I know, this won't 'change' you, even a wee bit, would it?! 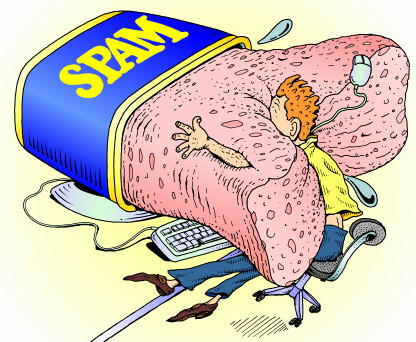 god banish those spammers from facebook.